4-Stroke MX Dirt Bikes Are Ticking Time Bombs Because…. First of all, I just want to say that four strokes motocross bikes are not bad or defective (most of them anyway), or that I’m partial to two strokes. This is just my honest opinion about the modern four stroke motocross bikes; 250f and 450f. They are very fast bikes and I will admit that they are easier to win a race with than a two stroke because of all the low-end torque they have, and the somewhat-smooth and endless power. But with that much advantage they must have a downfall, right? Well my answer would be yes, and the reason saying that is because these extremely high-revving, performance engines can grenade very quickly without much notice. Not to say that this will always happen, because a lot of riders can put one hundred hours or more on their four stroke motocross bike without having any problems. It is the owners that don’t maintain the bikes or repair them properly that this usually happens to. A two stroke top end is fairly easy enough for most riders to rebuild if they have a manual and the tools, but a 4 stroke engine is more complex with many more parts involved. 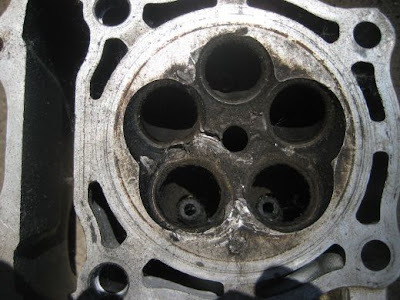 If one slight mistake is made, such as over-torquing a bolt in the engine, the engine can and most likely will break down, and if one part in the motor breaks then it usually breaks other parts. The cost to repair a four stroke engine is enormously high, especially if you take it to a mechanic. Take this for example: You have a 250cc two stroke and 250cc four stroke that both have blown top ends and you will be having a professional mechanic do the work for you. The 250cc two stroke will cost anywhere from $200-500 for brand new parts and another couple hundred for labor. Then you take the four stroke, and the parts will cost around $1000 if not more, plus you have to pay for labor. Also, if you do the two stroke yourself, which most riders do, you won’t have to pay labor fees. Now I’m not trying to start an argument about two strokes vs. four strokes, or even try to convince you to buy a two stroke. I’m just expressing what actually can happen to these bikes. Although four strokes are easier to ride, the repair bill can add up to the cost of buying another used bike. I have both types of motocross bikes and they are both great to ride, but I normally go with the two smoker because it is much cheaper to maintain. If you want to ride four stroke, by all means go ahead, have fun, and make sure you maintain it. But get ready for a big bill if something happens…… Thanks for viewing. Posted on September 7, 2009 Author mxhideoutCategories Bike Maintenance, TipsTags 4 stroke dirtbike disadvantages, 4 stroke maintenance, blown up dirtbike, dirt bike blowing up, four stroke dirt bikes, four stroke problems, maintaining dirt bike1 Comment on 4-Stroke MX Dirt Bikes Are Ticking Time Bombs Because….